Rumor: iPhone 5 To Sport Edge-To-Edge Display? There’s been a lot of speculation as of late over the next model iPhone. Will Jobs pull a 3GS on us and leave the form factor alone or will Apple go big and create some new hardware to go with that awesome new OS? Well, we may be inching closer to some answers today, as an app developer with connections to Nuance, the speech recognition firm, posted a few screen grabs of what appears to be a next-gen iPhone with an edge-to-edge screen. 9to5Mac originally found the photos, which displayed the SpeechTrans Ultimate Powered By Nuance app in the iTunes store. But SpeechTrans TM, the developer responsible for the photos, was tricky about it – only two of the five screen shots posted appear to be on a new iPhone, the rest were on a regular old iPhone 4. Since the photos are obviously mock-ups, it’s totally possible that the developers had a little brain fart when calculating measurements. On the other hand, Nuance is expected to be a pretty big part of iOS 5, with its voice and speech recognition technology baked right in. 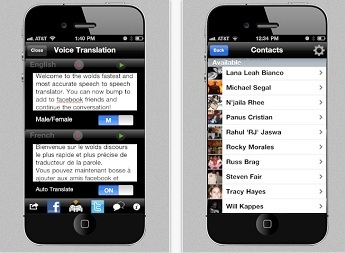 We know SpeechTrans TM has pretty significant ties to Nuance, so it’s certainly not too far off to hope that the app developer has some knowledge of what to expect out of iOS 5 and the next-gen iPhone, and merely wanted to let us in on the fun.